gypsum product. After calcining, CaSO4.1/2H2O is widely used in paper faced gypsum board and gypsum block and painting gypsum powder and model. through heating the dehydrate gypsum. Content of CaSO4·2H2O in gypsum mine > 80%. adopts the German GRENZEBACH BSH and GYPTECH company, Lafarge, the United States INC companies and domestic well-known enterprises Kitashinchi Group, Taihe Group advanced technology. We adopts the horizontal flow, vertical airflow heat exchanger heating system, the raw material feeding system and edge cutting and edge sealing and edge grinding and recycling system and stacking system are all controlled by computer. All the whole line is full automation. Gypsum powder production line adopts boiling furnace, high-voltage electrostatic dust removing and other advanced equipment, it is energy-saving and environmental protection. The main principle of drying system: the boiling furnace body is consist of delicate and intensive cooling coil pipe. Put the heat conductive oil in the pipe, and release the heat into the inside of furnace. There is a Roots blower under the bottom of boiling furnace, and blow the air into the furnace, until blowing the powder into boiling status. Under a certain temperature, the dried and dehydrated powder become light, and flow to the outlet automatically. The quality of this kind of gypsum powder is stable, because the equipment adopts dried electrostatic dust remover, so the dust-removing efficiency is above 95%. Because we realize fluidization, the furnace does not need moving component, and the structure of the furnace becomes simple. Not only it is easy to manufacture, but also we do not need maintenance after put into operation. Because we use low-temperature source, so the furnace does not have any risk of being burnt in any condition, also the equipment will have a long life. The boiling equipment is vertical-arranged equipment, and the dust remover on the top of the furnace, make a complete body with the furnace. So the equipment is compact and low area coverage. 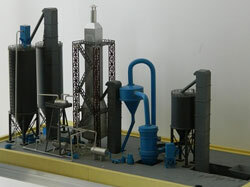 The boiling furnace with low heat and electricity consumption. In the part of energy: Most of the heat is used to dehydration and decomposition, and the rest of small part is used to heat the air from the bottom of the furnace. The heat efficiency of the furnace is above 95%. Of course the boiling furnace uses the second heat source, and final heat efficiency is amounting to the furnace efficiency multiply the boiler efficiency. But the steam boiler and the hot oil boiler are all mature hot equipment with high heat efficiency. The steam boiler can reach to 60%-70%, hot oil boiler can reach to 70%-80%. (our company adopts heat conductive oil furnace), so the general heat efficiency is high. Use steam, it can reach to 57%-67% .Use hot oil, it can reach 67%-77%. In the parts of electricity: the boiling furnace does not need move, also without mixer, it realize the fluidization by the steam of gypsum dehydration, because blow limit air into the bottom of the furnace, so the power of the blower is low, and the boiling furnace have less electricity consumption than the traditional calciner.